May was some of the best snook fishing I have seen since the big freeze 7 years ago . Everyday that we were out on the water, we caught a good number of snook that were of nice size. 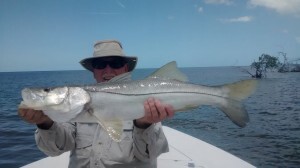 The beautiful snook in the picture was caught just outside of Everglades City, near the west pass area, and was one of several we caught on that day. June is here now, and I expect the snook fishing will remain just as good as May. Don’t miss out on some great fishing! Give me a call, and let me get you out on the water for a great day of fishing!